AUGUSTA, Maine — Gov. Paul LePage achieved one of his top priorities of the 2013 legislative session Friday when he signed into law a bill that sets the stage to pay off the state’s $183.5 million debt to 39 hospitals. The bill, passed late Thursday night by the Legislature, would use revenue from a renegotiated contract for the state’s wholesale liquor business to finance revenue bonds to pay the hospitals for services they’ve provided under the state’s Medicaid program, MaineCare. A refinanced contract could bring as much as $40 million in new cash flow to the state on an annual basis, some of that revenue would be used to finance a lump-sum payment to hospitals. Maine is one of only a handful of states that controls the importation and distribution of hard liquor, but in 2004 the state leased those rights for 10 years to a private company for $125 million. Steven Michaud, the president of the Maine Hospital Association, said the repayment of Medicaid debt will also pump an additional $300 million into the state’s economy in federal matching funds. While the payment would be a one-time expenditure for past debts, it would help hospitals, many of which are depending on lines of credit to manage basic expenses like payroll for employees. Michaud said the back payment would put some of the state’s largest employers on more solid financial footing because they would no longer be incurring the costs of interest on that credit. 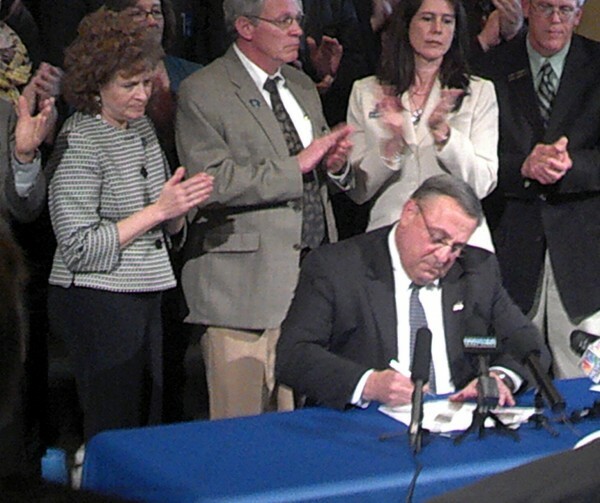 LePage signed the bill with little fanfare and without ceremony Friday. The Legislature controlled by Democrats earlier sent LePage a bill linking the debt repayment plan with legislation that would have allowed the state to accept federal money under the Affordable Care Act to expand MaineCare. That legislation went to LePage in a separate bill that lawmakers passed late Thursday. An additional $200 million in state-backed construction bonds also will be released as result of the deal. LePage has withheld signing off on the voter-approved bonds until a bill to pay the hospitals was enacted.